On the cusp of spring. 7C, brisk SW, little rain, sunny. Spring is coming, not here yet even though many Snowdrops are out. The air does not yet smell of spring sweetness though. Relief though, my troublesome ankle was no real problem. I was worried about that. I am making a big effort to push long quick pedal strokes, pushing heels low. I suspect that it’s toes down cadence that causes the problem. I have to get this right, if I am to do those big rides later in the year. Last summer, I did one ride of 100 miles in one day, but this year I want several. Maybe pushing the distance more each time. Wouldn’t it be great to do 140 in one day. 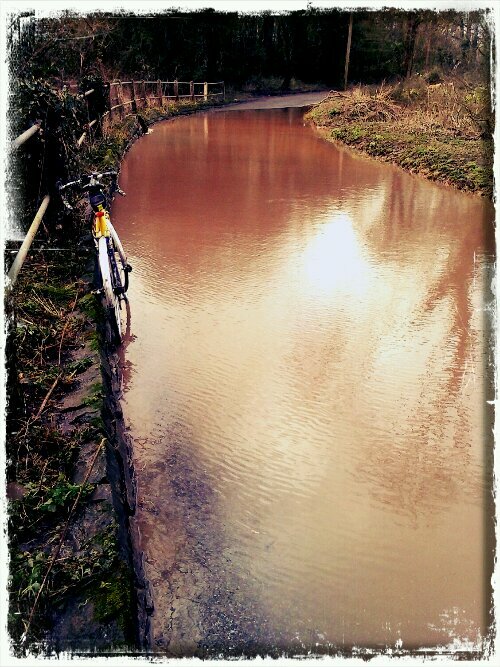 There were floods, four that I had to ride through.